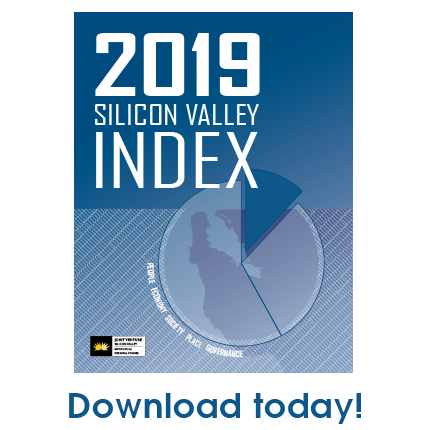 Joint Venture Silicon Valley first produced the nationally recognized indicator project, the Silicon Valley Index, starting in 1995. 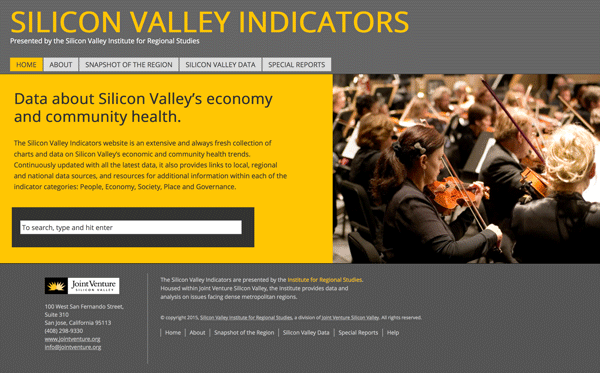 Released every February, we measure the strength of our economy and the health of our community—highlighting challenges and providing an analytical foundation for decision making. Many other regions have followed suit and publish these useful tools. California Center for Regional Leadership: The California Regional Progress Report (June 2007) is the first comprehensive statewide indicators report built from the regions up, reflecting the diversity of the State's regions but also shared issues of statewide significance critical for the sustainability of the State's quality of life, prosperity and access to shared opportunity. Great Valley Center: We work in multiple ways to engage and inform citizens, train local leaders, and deliver programs that respond directly to critical gaps in the Valley’s communities. Greater Portland Pulse: Greater Portland Pulse provides data and context to promote informed decision making in the Portland, Oregon, metro region. Boston Indicators Project: Works in partnership with community groups, civic leaders and Boston’s civic data community to produce special reports. Long Island, New York: The Long Island Index, a project of the Rauch Foundation, provides the latest data on conditions on Long Island, trends over time, and comparisons with competing suburbs. Sustainable Seattle: Focused on long-term sustainability, equity and resilience in the Puget Sound Region. Pittsburgh Today: Our mission is to provide reliable information so the region’s citizens can understand where we are and use that knowledge to determine where we need to go. Jacksonville Quality of Life Indicators: Arts and Culture, Economy, Education, Employment, Environment, Governance, Health & Wellbeing, Housing, Public Safety, Recreation, Social, Transportation, Population. Georgia Community Indicators: This survey collects data on local government operations, including financial management practices, service delivery arrangements, public facilities provided, and planning efforts. Anchorage Community Indicators: Anchorage Community Indicators is a public education project of the Justice Center aimed at providing information about various aspects of the Anchorage municipality through maps and tables. Spartanburg South Carolina Indicators Project: Presents data and engages the community in dialogue and strategy that leads to positive change in Spartanburg County, South Carolina. Calgary's Vital Signs: Vital Signs leverages local knowledge to measure the vitality of our communities and support action towards improving our collective quality of life.